It’s nearly the end of summer – the early days of September when the novelty of long summer days and sleeping late on weekdays has long since worn off. My kids are entertaining themselves in a variety of ways that involve a lot of bickering, whining, and sometimes even tears. With the beginning of school looming large and fast I’m dreading not just the daily, early morning school routines (which also tend to involve a lot of bickering, whining, and tears), but also the pall of fatigue that hangs over the household during the first couple weeks of the school year. I’m going to be dragging them out of bed for the first week of school and they’ll be dragging (and cranky) in the afternoons each day until their bodies adjust to the change in their daily routine. Each year I tell myself, “If I was a good mom, I’d make my kids start adjusting to the school schedule at least a couple of weeks before the first day of school”. I understand that I should try to get them to adjust their body clocks, but it’s the execution that trips me up. Forcing my kids to readjust their sleep-wake schedules feels like an exercise in futility because I can’t make them go to sleep. Sleep can be an elusive butterfly; we can voluntarily lay ourselves down to go to sleep, but we can’t decide to sleep if the conditions aren’t exactly right for it to happen. Even though my kids and I know that they need to go to sleep earlier their bodies just won’t do it. Adjusting to the early school days is a challenge many parents face when summer draws to a close. Our bodies have seasonally adjusted to the longer daylight hours and the warmer weather that comes with summer. All of us have an internal body clock that is tuned in to the daily cycle of sunlight known as the circadian rhythm. Exposure to daylight gives our bodies very powerful cues for staying awake and alert, while darkness causes our brains to activate the production of melatonin – a hormone that makes us feel sleepy. With the extended summer days it can still be light outside until very late in the day. The absence of the ‘curtain of darkness’ that signals the sleep cycle energizes us and keeps us awake for as long as the sunlight is still visible. Our internal body clocks really run on a cycle that’s slightly longer than 24 hours. Scientists have conducted experiments in caves and other controlled environments where they completely removed all sources of daylight and allowed the human subjects to follow their natural body rhythms to see how close their daily sleep-wake cycles coincided with a 24-hour clock. They found that when humans are left to follow their own, internal body clock that it has a tendency to drift longer than 24 hours. What that means is that our bodies want us to stay awake a little longer each day, sleep later in the day and rise a bit later the following day. This is why jet lag after traveling west is less severe; lengthening your daily wakefulness and delaying sleep is much easier than trying to go to bed earlier and shorten your day. I have a really difficult time convincing my children to go to bed when it’s still light enough outside to play (well past their school night bedtimes). Maybe it makes me a bad mom, but I allow my children to stay up later at night during the summertime because their bodies just won’t go to sleep and they don’t have to get up early the next morning. If I was a great mom I would put my children to bed at exactly the same time every night, into a bedroom with all sources of light removed (for complete darkness), make sure the room was approximately 60 to 65 degrees F, eliminate all sources of fun and excitement from their day at least one hour before bed, and create a soporific bedtime routine to lull them to sleep each night. I would have no problem getting their schedules adjusted for early rising (just after dawn!) on school mornings by the first day because they would be accustomed to the early rising each day all throughout summer (even weekends!). Instead, I’m a real human mom who doesn’t always get the discipline into the sleep schedule during the summer that we know we all should. Sometimes, just letting your kids know that they’re going to be readjusting their body clocks once they start getting up early for school again helps them understand how important good sleep hygiene really is. 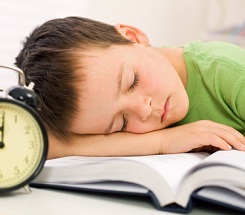 Hopefully, the excitement of going back to school and seeing their friends again will help them overcome the downside of the sleep adjustment. Knowing that they’re probably going to be cranky/weepy/irritable and even extra hungry while their bodies get back into the swing of school can help parents adjust their tolerances during the first couple of weeks. That and a little extra coffee each morning….